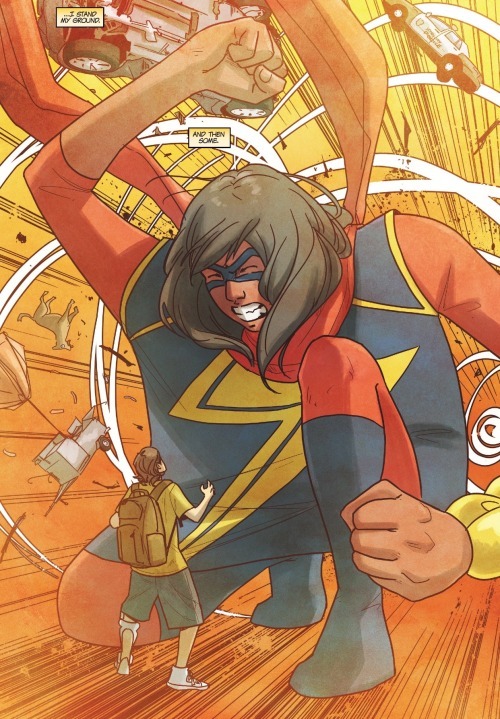 Ms. Marvel’s powers are on the fritz. Her ability to stretch, grow, shrink and embiggon just aren’t working the ways they used to. And it’s all happened at the most disadvantageous of times as she and her pal Bruno find themselves facing off against the super villain known as The Shocker. Brought to us by the creative team of G. Willow Wilson, Nico Leon and Ian Herring. 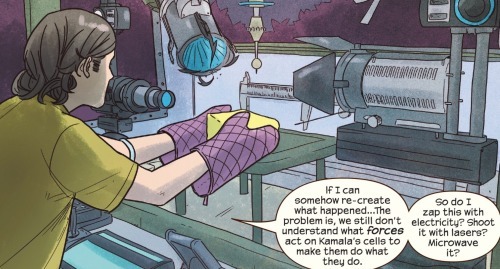 The Inhuman powers Kamala found herself endowed with are pretty cool, yet like many super powers, they don’t make a whole lot of scientific sense. 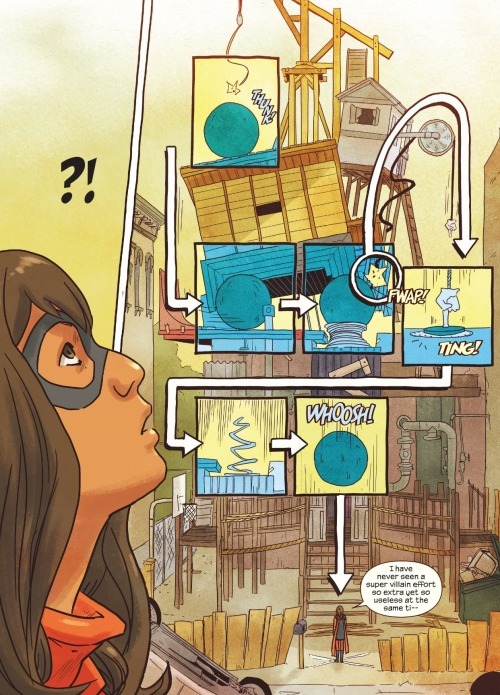 And Kamala and Bruno decided to utilize their intellect, curiosity (and need to avoid their budding romantic feelings toward one another) so to try to figure the whole matter out. This included Bruno using a small electrical device to monitor the surface volume of Kamala’s embiggoning. Something in all this triggered a feeling of complete unease in Kamala as she found herself both terribly anxious as well as unable to fully control her powers. 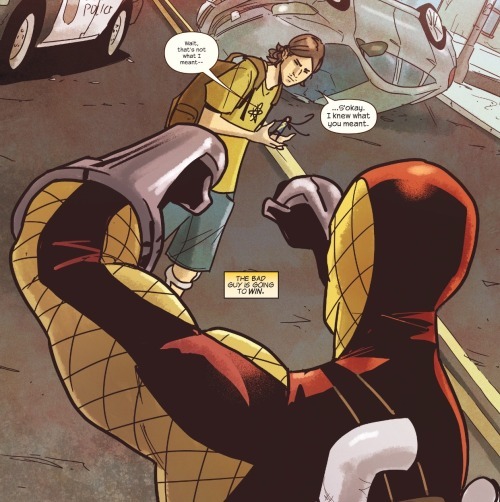 It remains unclear exactly what brought this about… and there hasn’t been time to figure it out in that the B-list Spider-Man villain, The Shocker, has come to Jersey City to capitalize on the relative dearth of masked do-gooders who might thwart his nefarious schemes. At first it looked as though Ms. Marvel would have little difficulty with this second-grade cad… yet once more her powers malfunctioned. She shrank down to just inches, leaving her and Bruno all but defenseless against The Shocker and his pulse-emitting gauntlets. Oh no! The Shocker fires off a pulse wave that is sure to do in both Bruno and Kamala. The desperation of the situation forces Kamala to push through her difficulties and she manages to embiggon herself into the form of a giant shield, deflecting the pulse wave. Realizing that the battle might not be as easily won as he had thought, The Shocker runs off… with a stubborn Ms Marvel in hot pursuit… much to Bruno’s consternation. She catches up with him and just when it looks like the two are about to throw down for another superpower show-down, Ms. Marvel’s powers go all wonky once more. Her body flattens, becomes ribbon like… it’s all quite strange. Kamala’s consciousness seems to be transported to some sort of neither-realm, a quantum space between worlds. It’s unclear what is happening to her and Kamala is absolutely baffled by it. What does all this mean… what is happening? The Shocker is less interested in it all. He’s pretty much ‘well, that’s weird’ and then shoves off to his fort. I was sort of wondering what the villain was doing stealing pipes and building supplies in the previous issue and now we know. He’s built himself a good old fashioned super villain lair…. What a nut. The Shocker has always aspired to elevate his station from mid-tier threat to a cad on par with someone like Dr. Doom. And every grade-A super villain needs a secret lair, so Shocker has built his own. It’s very silly, something akin to a little kid who makes a fort out of couch cushions and blankets. Well, it turns out that The Shocker’s fort is not as harmless as it initially appears. Despite his silly wardrobe and poor track record as a villain, the guy is actually a pretty skilled engineer. 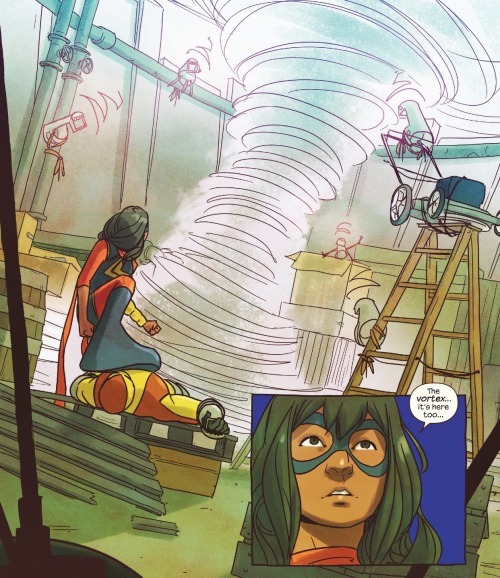 He’s built into his fort a complicated Rube Goldberg-style contraption that catches Ms. Marvel off guard and propels her up into the air and right down into the heart of the fort. She lands before The Shocker who then proceeds to launch into a rather pat attempt at super villain monologuing, explaining how in Manhattan he is little more than a run-of-the-mill bad guy… yet in Jersey City he is a much bigger fish in a much smaller pond. 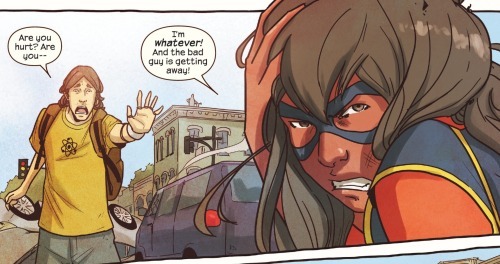 Now he is Ms. Marvel’s arch nemesis and blah blah blah… it’s quite silly and Ms. Marvel is not especially impressed. 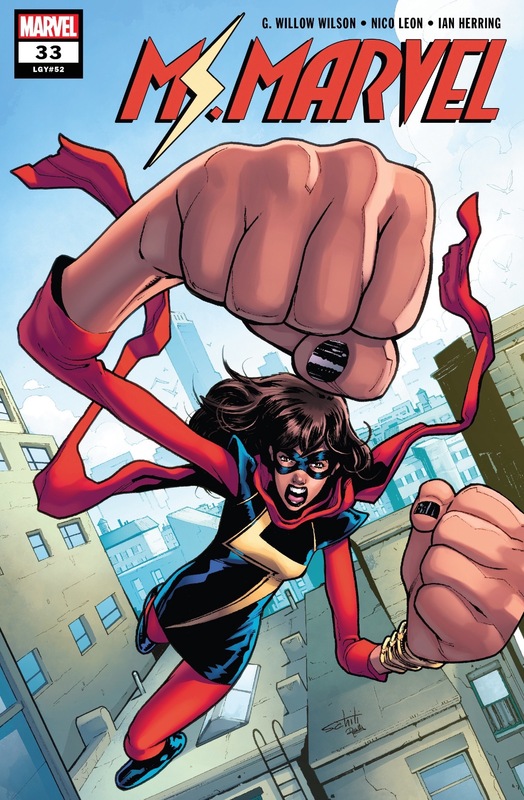 Ms. Marvel’s wallops The Shocker with an embiggoned fist. He seems defeated, but mutters that he has one last trick up his sleeve. Just then a spinning vortex begins to twirl about in the center of the room. It’s unclear what this is, from where it comes from, yet it seems familiar to Ms. Marvel. Has it to do with that strange neither realm Kamala’s mind had been sent to when her powers malfunctioned? The answers will have to wait until next issue. Whilst all this is going on, Bruno has rushed back to his lab, desperate to use his wit and intellect to figure out what exactly it is that has caused Kamala’s powers to malfunction. With the aide of a not-so-helpful hologram of Professor X, Bruno attempts a series of experiments that he hopes will allow him to understand, and hopefully undo, whatever it was that triggered Kamala’s loss of control over her abilities. 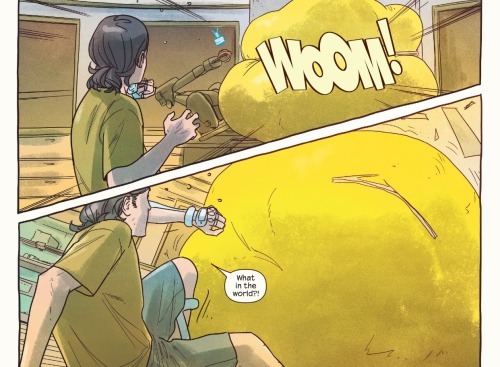 The central mystery as Bruno sees it is Kamala’s ability to increase and decrease her mass while maintaining a standardized volume and density. It all defies the central tenets of physics. An object in space that enlarges in size should increase in density; one that shrinks should decrease in density… that’s how things work. Yet Kamala’s abilities don’t work that way and Bruno believes that discovering the reasoning behind this is key to helping her regain full control of her powers. To this end, Bruno conducts an experiment where he takes a chuck of proto-matter, imbues it with Kamala’s genetic signature and then subjects it to a broad spectrum of light and electricity. Of course this is a terrible idea and the chuck of matter immediately begs to grow in mass at a rapid rate, threatening to destroy the lab and crush poor Bruno. And here, with both Kamala and Bruno facing rather grim circumstances, the issue comes to an end with the promise of continuation in the next installment. 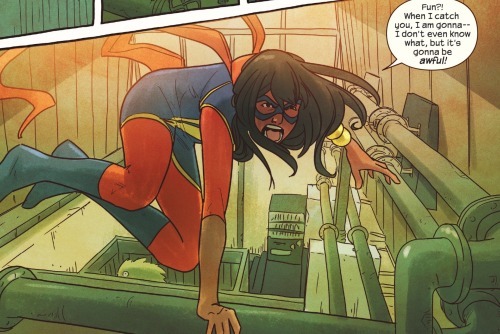 My original hypothesis from last issue, that Kamala’s malfunctioning powers were the result of a superhero version of panic disorder, looks to be proven quite wrong. Rather it seems that her ability to increase and decrease mass without impacting volume may have to do with accessing some sort of an outer-dimensional realm. Sort of like temporarily borrowing and depositing mass from a place outside of the earthly confines of physics. 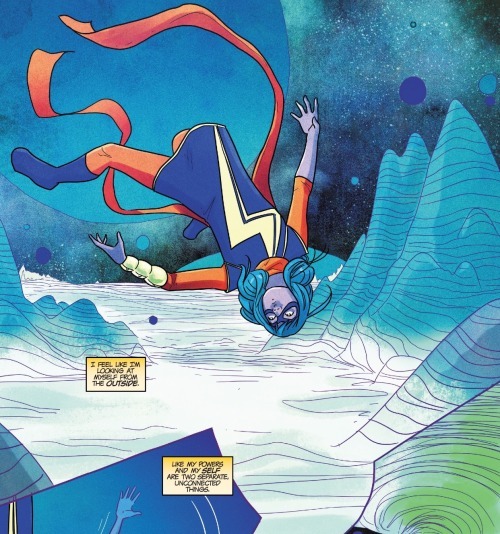 And perhaps tinkering with this other worldly realm might not come without some sort of ramification… some sort of affect that is finally catching up with Kamala. And I’m anxiously looking forward to finding out. Whatever the case, the narrative offers the art team of Leon and Herring to stretch their collective wings in offering up some very cool visuals. I especially liked Kamala’s mental excursion to the weird neither-realm. 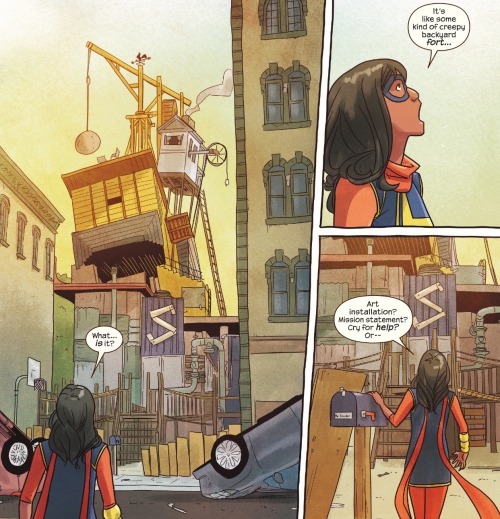 So much of Ms. Marvel’s adventures take place in the confines of Jersey City, so it is cool to see her in different, more science fiction oriented environments. 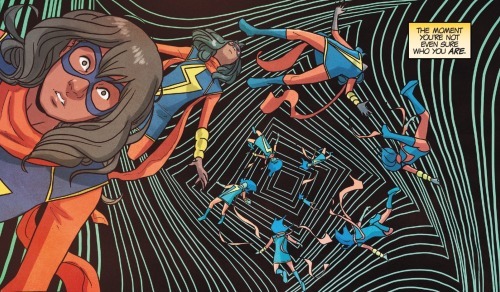 Another fun bit was Kamala’s unintentional transformation into a flowing ribbon-like form. It was both neatly illustrated and made for a very funny bit where The Shocker is trying to contend with the fact that his grandiose plans for a big hero-versus-villain showdown isn’t going the way he had hoped. It’s clear that Leon and Herring had a lot of fun offering up the art for this issue and it’s equally fun to take it in. Superhero comic stories these days have been very much reconfigured to fit into collected trade paperback format. 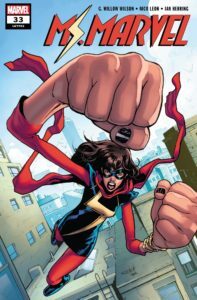 Books like Ms. Marvel, Moon Girl, and the like tend to sell much better in trade form compared to the individual issues. As a result, there are less one-and-done stories and more tales designed to unfold through the course of three to five issue arcs. This is fine, I know plenty of folks who much prefer collected trades over serialized floppies. The one drawback is those middle issues where the plot is sometimes unnecessarily elongated and answers and resolutions are withheld. These sorts of issues often act to frustrate my desire to know what’s going on. Although this is likely just an idiosyncratic peeve. Whatever the case, while this was a very fun issue to read, it left me a touch unsatisfied. Nonetheless, definitely recommended. Three and a half out of five Lockjaws!